You will also need a tape measure and a 4’ level as well as a bullet (12”) level. 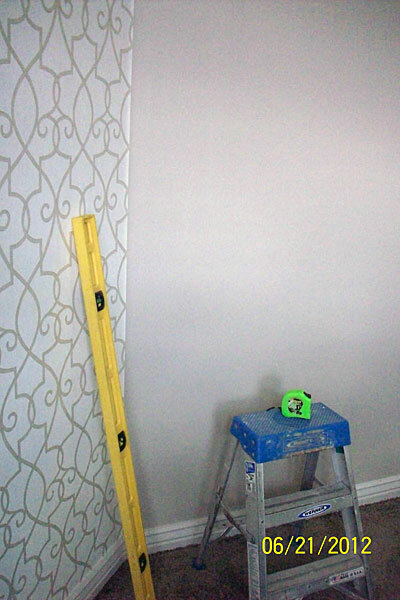 You do not want the wallpaper pattern to slide down a wall.You want each piece to be hung straight, hence start your installation with a pencil mark on the wall that has been made with the level so you know that you are starting straight. Double check your plumb about every three strips and correct if necessary for straight installation. Hidden Springs Store Grand Opening! We wanted to update my daughter’s room from a ‘little girl’s room’ to something a little older/modern/hip. Robyn was AMAZING! She took our ideas and gave us some brilliant suggestions on wallpaper. We were able to transform the room into a classic space – with minimal cost or time! I’m already planning the next room in my house to transform. THANK YOU, Robyn and Design Source 101!!! The Design Source 101 Boutique is now open at 5849 W. Hidden Springs Dr. Regular store hours are Wed, Fri and Sat 11am – 6pm. Workshops are held on Wednesday evenings! We’re also available By Appointment, so please call to arrange a time that works for you!